Lewis Strang writes in Famous Actresses that she made he American debut at Palmer's Theatre, New York , on October 15th  and subsequently making a most successful tour of the country. She played besides "The Transgressor" Marguerite Gauthier in "Camille", Gilberte in "Frou-Frou" and Juliet in Romeo and Juliet." 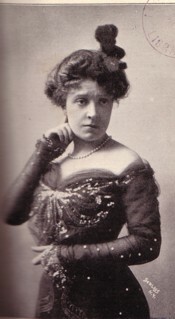 ... "The Transgressor" by AW Gattie, in which Miss Nethersole made her first appearance in this country, was a somewhat crude play of the "problem" order, and in it the actress's opportunities to show her emotional power were somewhat limited... . Miss Nethersole made her greatest success that first season in "Camille".' It was an intensely realistic impersonation, deeply emotional and ardently passionate, an impersonation that moved on by its great dramatic vigour rather than by subtilty of conception of finish in acting... Miss Nethersole's Juliet was not highly esteemed. While she had moments of genuine power, her acting as a whole was uneven, besides being hurt by undue force and intensity." I should be pleased to omit any reference to "Carmen" but the notoriety of the Nethersole kiss will hardly permit that. The adaption of the novel that Miss Nethersole used, made a filthy play in which lust and animal passion were shown with disgusting frankness. Even if one ignored the vileness, he found but a cheap melodrama, poorly constructed at that, and abounding in mock heroics, false platitudes, and cheap sentiment... Miss Nethersole's acting was a study in lasciviousness, marvelously vivid and marvelously true to life". A 1901 Cosmopolitan article "Through bad business arrangements and misunderstandings, three managers claimed her on her arrival, Frohman, Daly and Marcus Meyer. As none of these was sure of possession the new star was not properly advertised." We begin rehearsing Frou-Frou this Morning, but when it is to be played I do not know. I was in high hopes we had done with rehearsals for a time, but this very ambitious young Nethersole is determined to keep us at work. I did not have time to think since we commenced in New York until Friday last, when for the first day we had no rehearsal. It has been something dreadful but to my own astonishment I have pulled through. We are playing at the "Alvin" Theatre, almost adjoining this hotel. Next week Washington, the following week Baltimore. That is as far as I know at present. We played Camille the past two nights, and the curtain did not fall on last act until 10 minutes of 12 each night. I being so near theatre got into my room at "14 of 12" but in New York and Philadelphia it used to be half past 12 before I got home, and it was very tiring to me. I used to get to 3219 Clifford Street [Philadelphia] at from half past 12 to one AM every night. Get up at 10, take a breakfast and down to rehearsal, which would often not allow one time to go home to dinner, but I would get dinner at restaurant and go back to theatre to dress for performance. One Morning of the night we produced Romeo & Juliet, it was 5 in the Morning when I got home, we having a rehearsal after the performance of the Transgressor which began at 1 AM and lasted for me until 1/2 past 4. Then Hattie & I got into a cab and arrived home at 5 AM. Toronto Canada Dec 24th 1894 We open with Camille to-night and play it at Matinee to-morrow and Thursday night -- and Saturday night -- Wed night Romeo & Juliet. Friday night and Sat night Frou-Frou in which I do not appear. Montreal Jany 1st 1895 Last night Miss Nethersole & [Marcus] Mayer gave a little supper to the Company at the Windsor Hotel, and I went, and it was nearly 2 AM when I got back to this hotel. A nice way for an old lady to begin the New Year. Chicago Feb. 1895 I am glad you and your friends enjoyed Camille but am sorry you will not be able to see Romeo & Juliet - for we do not return to New York to play at [Stanford White's] Garden Theatre or any other theatre with Miss Olga [Nethersole] at present.